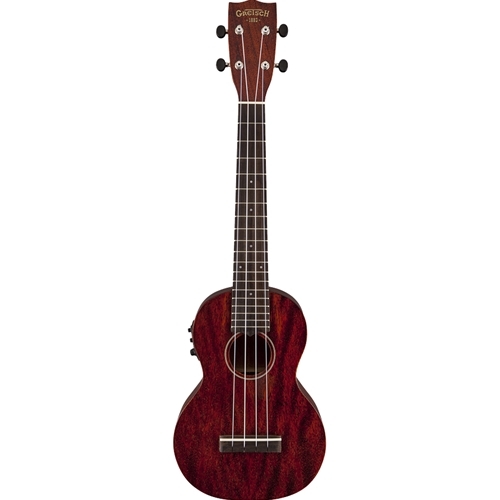 The Gretsch G9110-L long-neck concert ukulele with Fishman Kula electronics puts out a deeper, fuller sound than your standard soprano uke. The G9110-L's longer, tenor-scale neck gives you access to more notes with a 17" scale length and a remarkably comfortable feel. Crafted with a mahogany body and neck, the tone of the G9110 is plenty mellow, with just the right amount of top-end snap when strumming. Plug in at show time and get the awesome sound of the onboard Fishman pickup and Kula electronics, with a built-in tuner and 3-band EQ to shape your sound as needed.